Security is much more than just a matter of moustaches! 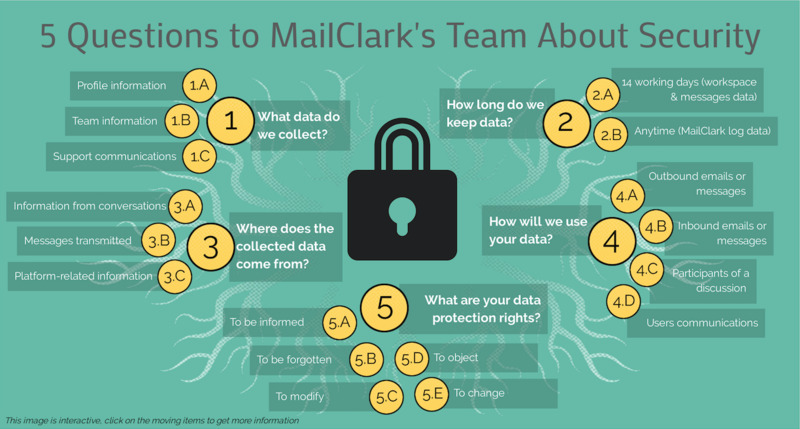 At MailClark, we are a small team of humans concerned by the same problems as you: we know that your emails and other messages are absolutely private so we take all necessary organizational and technical measures to maintain the safety of your personal data. Privacy and security, two important topics when it comes to emails, right? This is not a new language invented by some geeks 😃. GDPR means General Data Protection Regulation. Yes, we agree, it’s a barbaric abbreviation. GDPR is a new legislation giving you better security, transparency, and control of your personal data online. It came into effect in the EU on May 25. Why GDPR is safer for my business? Data security is very important for your personal data and business data. GDPR is based on 5 main points. You can easly get information about how, why and where your data is used. We can inform you by request. You can decide to delete your data from any server or data storage, even if you have previously given consent. You can correct at all times if any information about you or your company. You can also request a limitation to the access and handling of your data. This is the right of restriction. You can object if you have been automatically profiled or if you consider data affect you significantly. If you are unhappy with the way your data has been treated, you can simply move your data to another controller. This is the right of portability. Our entire team is subject to a confidentiality agreement on our customers’ data. Choose the type of content or communications you’d like to receive—including none. We are committed to notifying our customers of any attack, breach of confidentiality, leak or data theft. Give me more about GDPR! Do you want to know the full GDPR policy? Ok! First good luck! This is full of complicated rules and words. Secondly, you can check it out here. Do you not have MailClark yet?